The colored coolers from Zero Infinity are now available for pre-order at Caseking.de. The violet fan blades and accents define the look and feel of these new cooling units. The top model by the name „Free Flow+“ impresses with three fans in combination with direct touch heatpipes and dual tower design, allowing it to cool even the hottest and fastest processors with ease. Based in Hong Kong, the new brand aims to turn the heads of the enthusiast crowd. The name: Zero Infinity. „Zero“ and „Infinity“ present two opposite aspects for many mathematician, physicists and philosophers , while still distinctively connected to each other. As a computer enthusiast, the product simply needs to perform and it is obvious that Zero Infinity has chosen to produce an uncompromising cooler with the Free Flow+, offer wast cooling potential, thanks to the design, with three 140 mm fans in a unique blend of black and violet colors. Two symmetrical cooling towers with 46 fins may hold one fan each, with the third placed in the middle. Such a setup creates a potent and efficient air flow which is also the reason for the name of the Free Flow+ cooler. With the fins firmly attached, spaced 2 mm apart and completely Nickel plated, the Free Flow+ impresses with a clean silver shine while adding to the overall resistance against corrosion and finger prints. To maximize the total dissipation area, each of the fins are completely covered with dimples. To transfer the heat from the CPU to these fins, five U-shaped heatpipes have been embedded in the two cooling towers. These pipes have also been Nickel plated and have a diameter of 8 mm. Thanks to the direct touch technology in the base of the cooler any heat is efficiently transfer to the heatpipes of the cooler. Due to the mounting kit even the hottest CPU are easily kept cool as the unit ships with mountings for Intel 771, 775, 1155, 1156, 1366 and AMD AM2, AM2+, AM3, AM3+, FM1 sockets. Thanks to the three included fans, one may choose which constellation best suites the system, giving the user the utmost flexibility. While the Free Flow+ takes the cake in terms of cooling performance, Zero Infinity offers a full line of more compact, but by no means less impressive units. The Phantom Knight and Shiva also ship with the cool violet fans and also offer other esthetic aspects. While the Phantom Knight ships with all black fins and heatpipes, Zero Infinity has included various top covers in red, green, orange or violet for an exceptional level of of customization. Thanks to the use of 8 mm heatpipes, even the compact Phantom Knight is easily able to cool all modern processors with ease. With the Shiva, Zero Infinity even goes a step further by offering to different versions, with one featuring black fins in combination with a violet cover plate and the other offering silver fins and a golden cover. The cooler also ships with a pair of fans and utilizes direct touch heatpipes. Last but certainly not least, Zero Infinity also offer the ideal solution for low profile systems with the Vesta, as it measures a mere 96 mm in height with the installed fan. Four 6 mm heatpipes transport the heat of the CPU to the numerous fins. As is the case with all CPU coolers from Zero Infinity, the Vesta is compatibly with all major Intel and AMD sockets. 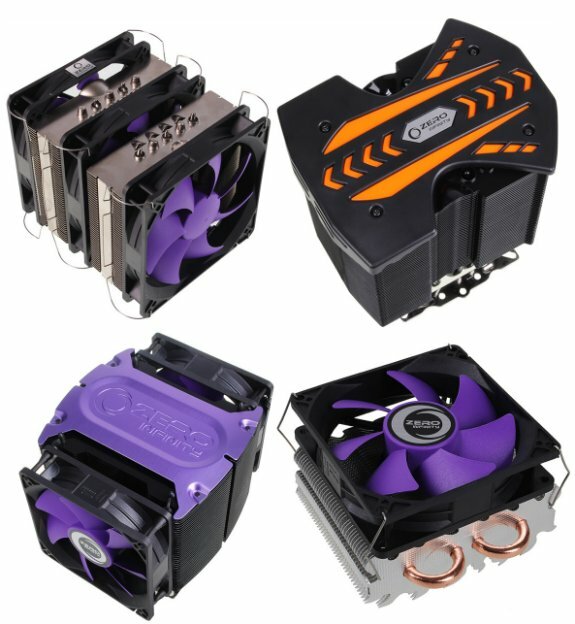 The CPU coolers from Zero Infinity will be available from the beginning of February and start at 27.90 Euro at www.caseking.de. An overview of the coolers from Zero Infinity can be found under the URL http://www.caseking.de/zeroinfinity.